I’ve been working slowly to reduce clutter around our house after looking around and seeing that it’s been creeping slowly from closets, corners, basement, garage, and just about anywhere else it’s allowed. Just about every week I’ve been breaking down cardboard from some area or another and adding it to the recycling pickup. I’ve also got a few stacks of items to go up on sale at eBay or Craigslist, some toys, collectibles, and plumbing fixtures. Nothing that’s going to make us rich, but it’ll get rid of clutter and add a few bucks to our pocket. All of these are items that should not simply be tossed out, as they can pollute landfills and groundwater supplies. So, when I saw that the county was having a hazardous materials event, I put it on the calendar a few months in advance, and started working to plan for it a few weeks leading up. My wife loves color around the house. As such, every room is a different color, which means lots and lots of paint cans that get stashed away once painting is complete. I had three shelves of paint cans in the basement from various painting we’ve done since we moved in, as well as a bunch out in the garage that was left by the previous homeowner. I went through the basement cans one by one. In some cases, shaking the can yielded basically nothing, so I knew that they were gone. In other cases, when I popped the top off, you could smell that they’d gone bad, or in other cases, rust had built up around the lid, which contaminated the paint. There were a few instances where we had paint that was no longer on the walls, like rooms that have since become kids rooms, or a can of bathroom paint which got painted over because we couldn’t stand it after just a few short months. We had some ceiling paint and primer, both so old that last time I attempted to use them, there were solid chunks. The paint in the garage, I didn’t even bother with. It’s been out there for at least seven years, since we moved in, possibly longer. That’s a lot of extreme heat and cold. I knew it was worthless. In fact, one can of paint was basically sucking itself in. It was no longer round. So that was time to go. After all was said and done, I had 29 cans that I took to the event. 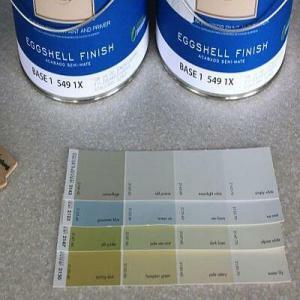 For each paint can that corresponded with paint that we still have, I wrote down the manufacturer, the finish, the blend number, the blend name, and the room where it goes. If I ever need more for any reason, I can go get a reasonable match. I had been building a stash of old, broken or useless electronics. I had some laptops from the 1990’s, PDA devices (remember your Palm Pilot) from the same period, a broken Discman, and a few other goodies. I ran a magnet over the drives and such, and was able to get rid of that pile. I take my lawn mower in every couple of years to get checked up, and they change the oil, but on years where I don’t, I end up changing the oil at home and storing it. I was able to pull that down off the shelf and get rid of a few bottles. Where I work used to have drop off points for batteries, but they stopped doing that. Now, we have a battery drawer, and I just have a ziploc bag that I throw the bad ones into. I was able to grab that and take it. All told, there were probably at least 100 batteries. It was a very simple process. They took care of everything for you. They had you pull up to a big parking lot in a nearby college, where there were cones that had you weave through in line. You had to show your proof of residence, an in our case we had to pay a small fee ($10), which varied by community depending on how much the local community contributed toward the event (residents of some communities paid nothing, others had to pay upwards of $60). Once you pulled up, to the unloading area, you had three stops, one where they pulled out anything liquid other than paint, so the motor oil came out, the next for paint, and finally the electronics. They also took medicine, household cleaner, and other assorted items. We didn’t get into any of that, but by getting rid of 29 cans of paint and everything else, I have a lot of shelf space freed up for items that we’ll never need. How much clutter is hazardous material taking up around your house? How do you handle the stuff gone bad so that it doesn’t take up unneeded space and gets disposed of properly? My wife and I went through a purge of the hazardous waste in our home about a year ago. We had to fold down all the seats in the back of our van, lay down a tarp (stuff was leaking), and we stuffed it full. Felt GREAT to get all that crap out of our house. None of my stuff was leaking but I did put down a tarp just in case something tipped over or decided it wanted to start leaking that day. No problem. A good portion of what we dropped off was stuff that was in the garage from when we moved in. Sitting there in the garage since 2007, in the hot during the summers and freezing during the winter. There was one can that was all sucked in, so I can’t imagine what was going on in there. Wow, 29 cans of paint?! I am impressed/shocked? It must be so, so nice to be able to get rid of all of that clutter. I have a bit of a collection, but it is mostly those tiny tins of stain, which don’t take up any space, and they are all still good. Your comment about break up cardboard hit home with me, I cannot believe how much paper and cardboard goes through our house, especially considering how many estatements we get and how little stuff we buy that comes in boxes! Agreed. We always recycle which I feel good about, but if you don’t do it right away, you’ll end up with it everywhere…as we found out! We have some old paint that I am letting dry out before throwing away. As for electronics, I’ve found that I can sell even broken items online. I guess the saying that one mans trash is another mans treasure is true! For the smaller electronic things – printer ink, new style lightbulbs, etc., I just bag them up and run over to a local retailer that lets you recycle them for free. We have a few big tins of paint around, but they are fairly recent and we still need them. We get rid of motor oil by bringing it to gas stations as soon as we change the oil in our vehicles, so that works out well. Batteries are difficult; we always put them aside and then forget where they are so they accumulate! We have a battery drawer which has new batteries as well as a big Ziploc where we put the old ones. ooohhh man, the paint can conundrum!!!!!!!!!! I also like to get pint cans and test colors in great clusters of patches. The result is, the human decides on one (count it, 1) color and ends up with about a dozen little cans of paint. What to do with them? They get saved for craft projects that…heh, wouldn’cha know?…NEVER HAPPEN. A year or two later, I open a garage cabinet and there, still lurking, are stacks and stacks of paint cans. Some of the paint manufacturers will now give you tiny little jars of sample paint, which helps a lot. I’ve seen these at Lowe’s and think maybe HD is doing it now, too. They charge you for them, and what irritates me the most is that they only have flat paint in the tiny little sampler cans. Nobody in the world paints walls in flat paint so you can’t use them for filler / touch-up or anything else.